Face Painting Advertising can be a challenge to many artists or companies. Knowing How and Where to advertise is always a challenge. There are many options, and price structures available. What ad model should I choose? How much should I pay to advertise? How can I keep track of results? How can I get my message across effectively? 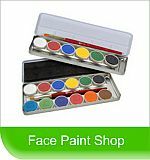 Why Not Advertise on Face-Painting-Fun.com ? We are offering Advertisers the opportunity to reach the face art world with various types of Adds. We are looking for content related adverts. The following types of businesses or individuals would be welcome. Temporary Tattoos, Glitter, Face Painting Accessories. SEO** (By this I mean companies that contact us trying to improve this sites rankings in the Search Engines) - SEO experts please take note, many of this sites pages feature in the top 10 of a global Google search. You would not have found the site if the site was not ranking well. Also we would not be offering advertising if the site recieved low traffic volumes. The cost to advertise will be a fixed figure paid in advance for one year. The cost will vary depending on a number of factors and each application will be considered, on it's merits.